If you are staying at Disney’s All-Star Music Resort between August and December of this year be prepared to make some different quick service dining choices. The hotel’s Intermission Food Court is closing August 1 for a months-long refurbishment. 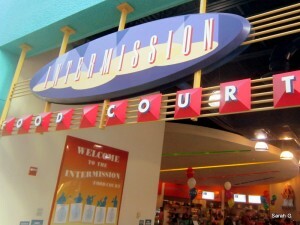 According to the Disney Food Blog, the food court is scheduled to be closed from August 1 through December 20. All-Star Music Resort guests will be able to purchase “grab and go” food selections at the Melody Hall Arcade, and transportation will be available to the All-Star Sports Resort so that guests may dine at the End Zone Food Court. (The End Zone Food Court underwent its own transformation last August). Thanks to the Disney Food Blog for use of their photo. Are you staying at the All-Star Sports Resort during the refurbishment? Leave us a comment and let us know what you think about the changes. This entry was posted on Wednesday, June 25th, 2014 at 12:00 pm	and is filed under Dining, Hotels, Planning. You can follow any responses to this entry through the RSS 2.0 feed. You can leave a response, or trackback from your own site. I’m staying there with friends on the 2nd and 3rd of August before check in for the Disney College Program! We were already planning on eating at Downtown Disney and a few of the resorts for most of our meals anyway, but I am a bit sad that I won’t be able to order a late night pizza if I want it!